Way back in December, which may not technically be a long time ago but it sure feels like it, I had given up on completing my Goodreads challenge. I was too busy with the move and life in general to read three books in a month, so with a week left, I had accepted that I wouldn’t complete my first ever Challenge. Side Note: I actually completed my original goal of 52 books in June, and then raised it to 75. But still, I set the goal and was bummed that it wasn’t going to happen. But then, something remarkable happened. I was chatting with a pal on Twitter (@angiyt, go follow her. She has the most adorable son of life and writes hilarious captions for the pictures she takes of him). Anyway, during our conversation, she asked me if I'd read anything by Cara Carmack. I said that I hadn't heard of her and then Angi was all: WHAT? GO BUY THEM RIGHT NOW. (Only with less screaming because Angi’s way too classy to be screamy). 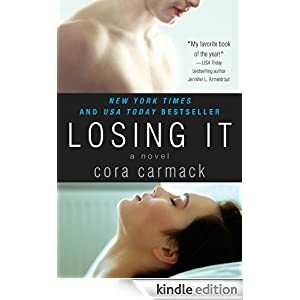 The very next day, because destiny is a funny thing, Cara Carmack’s series, Losing It, was on-sale. So onto my iPad it went. And then I promptly lost the next two days. Because I read them back-to-back-to-back (and therefore hit my Goodreads goal)! For the sake of brevity, I’ll sum up the awesomeness that is the Losing It series as succinctly as possible, but be warned: this will be a tad longer than my usual reviews (not that anyone would remember because it’s been so long since I’ve written one *headdesk*). My synopsis: Bliss Edwards is sick of being a virgin and decides that the quickest way to solve the problem is to have a one-night stand. And everything goes pretty much to plan, until she realizes that her super hot man candy is her new theatre professor. So look, I had major problems with the premise of this book. May-jah problems, people. For one thing, what’s wrong with being a virgin? And WHY OH WHY would you want your first all-the-way sexual experience to be with a stranger? Whyyyyyyyyyyyyyy? Judgment aside (of both Bliss and her BFF Kelsey, who were very hard to like in the beginning) the truth of the matter is that Cora Carmack can write. Like, really, really well. My synopsis: Mackenzie “Max” Millar isn’t your typical gal from the suburbs. She’s got tattoos, piercings, and is a general badass, so when her parents surprise her, she needs a wholesome boyfriend to keep them occupied—STAT. Enter Cade, Bliss’ Male BFF, who moved to Philadelphia to start a new life, and just happens to be at the right place at the right time, looking like the straight-edged dude he is. Cade and Max agree that he's to act the part, but, as you can probably suspect, things get really complicated, really quickly. Guys, there are few books that I’ve loved more than I loved Faking It. Seriously. It was that good. Max is a freaking fantasticly layered character, fully flawed and self-aware, and totally the kind of gal that I would want to be friends with. I’m not sure that she’d be so stoked to hang out with me, but the fact remains that I fangirled over her from about the twenty-fifth page, onward. She’s just so…so raw and vulnerable, but she’s also strong and determined. GAH! I JUST LOVED HER! And Cade—Caaaaaaaade. I love him just as much. No! I love him more! No, I love them equally! I PLAY NO FAVOURITES. Haha! But for reals, Cade is a fantastic character. I liked him in Losing It but fell stupidly in love with him in Faking It. And without Losing It, I’m not sure you’d get the same connection I got, which is why you have to read these books in order because otherwise, you’re cheating yourself and why would you want to do that? My Synopsis: (Remember when I kind of hated a character named Kelsey, who was Bliss’ Female BFF in Losing It? Well Finding It has her center stage and let me tell you, she owns that beyotch.) Living a life that most of us can only dream of, Kelsey is traveling across Europe with no real destination or purpose. That is, until she meets Jackson: an über hottie with mysterious eyes and god-like biceps. He helps Kelsey get herself together, but that’s when Kelsey realizes that she doesn’t know jack squat about him, which scares her more than all the things she’s been running from. Like I said, I wasn’t Kelsey’s biggest fan in the beginning of Losing It, but by the end, I had warmed to her. And then I was psyched to see that she got a whole book to herself because I knew there was serious stuff happening with her. I mean, there had to be, as she wasn’t the most stable of friends to Bliss, so I suspected that I was in for a great ride. And boy, I was NOT disappointed. Haha! I’m such a masochist when it comes to characters in books. 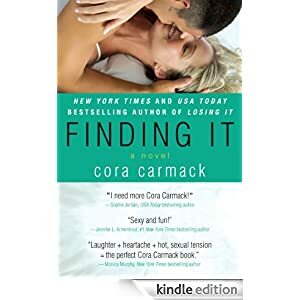 The romance in Finding It was most definitely the steamiest of the series, so be warned that you're probably going to want to make-out with someone anywhere from two to five times while reading it. Haha! Jackson, like Garrick, is ridiculously good-looking and has a level of personal torment that keeps you unsure about him--an element that I quite like in romances because it adds an extra layer of plot. Now, there is a fourth book in the series; a novella that is Garrick’s perspective from Losing It but I chose not to read it because I really liked him through Bliss’ eyes. There was another series, which I will not name, that had a change of POV which DESTROYED my love for a certain male character and I was too scared that the same thing could happen. As such, I can’t include it in this review, but to not acknowledge it would be weird because, you know, it’s part of the series. So there you have it, three book reviews for the price of one. Haha!! My general thoughts on the series is that it’s THE BEST New Adult that I’ve ever read, and I believe that all other NA characters should be like these ones: not quite fully-matured adults (haha, does that ever happen anyway) but still much more level-headed than YA. The writing is superb and engaging and I was engrossed in each character’s business until the very end. They are also most definitely romances, but they're contemporary and fresh so I think they will appeal to a fairly wide audience. This sounds like a fun series! I'm going to have to check it out. Popping in from Book Club Friday! Seriously, though, those sound fun. And I do love me some friends-turned-lovers romance (second book) and some flaaaaaawed characters. Yay! Thanks for the recommendation! Get on my goodreads NOW. I'd seriously probably have skipped commenting and starting reading, but I'm totally engrossed in another series right now and can't do ANYTHING until I finish it. Except read reviews, clearly. I just got the first book from the library and will now have to move it to the top of y to read pile. Thanks for the recommendation.